I have received the 2006 National Leadership Award from the National Republican Congressional Committee. Not only that, but I have been invited to he Honorary Chairperson for the NRCC’s Business Advisory Council. Doesn’t that sound impressive!? In addition to this prestigious honor, I will have my name in a full page ad in the Wall Street Journal listing me as a member of the council. They will send me a copy of the ad that I can frame for my office, along side the picture of our great President which they will send to me as well. I will be invited to several invitation only dinners with the President and Vice-President, and I will be a key participant in surveys that will effect tax decisions in the future. If I wanted to support to the council even further they gave me the opportunity to donate $500. 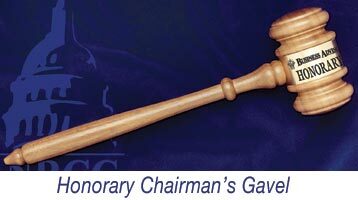 In return I would have gotten this lovely gavel, and the NRCC’s Daily Planner complete with a salute to the republican presidents. With this new notch in my belt I would from now on like to be referred to as The National Republican Congressional Committee’s 2006 National Leadership Award Winner & Honorary Chairman of the Business Advisory Council, or NRCCNLAWHCBAC for short. Too bad they only wanted my money..this would have been something fun to boast about! Wowsy Woosy AllyZabba!!!! I knew one day that you would get recognized and here it is!! !